Nightvision Glasses are optical devices that give the user the ability to see images in different levels of light approaching complete darkness. They are different to a Night Vision Device because they only intensify what light there is already available with purely optical means using large diameter objective lenses only. Nightvision Glasses include Telescopes and Night Binoculars (Giant Binoculars that have very large objective lens diameters) that are most commonly used as Astronomical Binoculars. What is a Night Vision Device (NVD)? Night vision devices are electro-optical devices comprising an IR image intensifier tube enclosed in a protective casing with some type of mounting system. Many NVD's also include IR illuminators and telescopic lenses and thus take the form of night vision monoculars, binoculars, goggles or scopes. They are different to Night Glasses because they are not purely optical devices. What Can a Night Vision Device Be used for? In the past they are most often used by the military and law enforcement, but night vision devices have now become much more widely available for civilian use. Common uses include: night vision filming and photography, nocturnal wildlife observation, marine navigation and security. A more recent use is the instillation of portable night vision cameras onto motor vehicles. 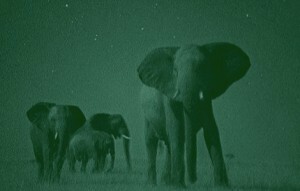 For more on wildlife observation, take a look at my article on Using Night Vision Binoculars on Safari. To put it as simply as possible, most night vision scopes, goggles, monoculars and binoculars are electro-optical devices that amplify whatever existing light there is and send it onto your eyes. You actually don't look directly through the optics of a night vision binocular or other night vision device as you do on normal optical binoculars (when used for night vision known as night glasses), you actually look at an amplified electronic image on a phosphor screen. The little light that there is available enters the night vision glasses through an objective lens and strikes a photo cathode. This cathode has high energy charge from the power supply which accelerates across a vacuum inside the intensifier and strikes a phosphor screen (similar to a TV screen) and is then focused. The eyepiece then magnifies the image for your eyes to see. Available light (energy) is collected by the objective lens (3) and focused on the image intensifier (1), Inside the intensifier a photocathode is "excited" by the light and converts the energy into electrons. The electrons accelerate across an electrostatic field inside the intensifier and strike a phosphor screen (2) which emits an image that you can see. This acceleration of electrons provides gain and enhances the image. So why are the images from night vision devices always green? This is because the human eye can differentiate more shades of green than other phosphor colors and so green is the color used. Night Vision Monoculars and other similar devices can 'see in the dark' when you can't because they are sensitive to a broad spectrum of light, ranging from from the visible right through to infrared, whereas human vision is confined to a small portion of the electromagnetic spectrum called visible light. Some night binoculars, goggles and scopes even have an accessory illuminator that can increase the amount of light available by shining a beam of light that is not visible to the human eye at the infrared end of the spectrum that the device can then use to 'see' in almost complete darkness. How Well Does Night Vision Work? A good question that largely depends on the quality of the device you are using and it's Generation. I guess a good way to show you is to use one of the cheapest night vision devices on the market, the Generation 1 ATN Viper Night Vision Goggle. The video below shows just how well even a Gen 1 device works in the dark and remember this was shot using a video camera without the correct connection. Video demonstrating how well the Gen 1 ATN Viper Night Vision Goggle works. Whilst Digital Night Vision is a far cheaper option, until fairly recently they only worked about as well as early Gen-1 Devices. 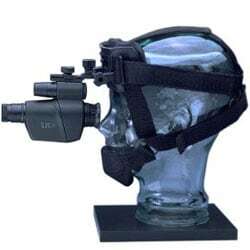 Howerver there have been changes and devices like the impresive iGen 20/20 Night Vision Viewer from Night Owl Optics can compete with many Gen-3 products at a fraction of their price. For more information, take a look at my article on How Digital Night Vision Works that also includes the advantages that they bring. The technology of night vision equipment has evolved greatly over the years, with the performance increasing and price decreasing which has lead to several "generations" of night vision equipment. Most commercially available nightvision equipment is rated according to it's 'Generation'. The Generation (Gen) is extremely important to take note of when comparing devices as they indicate the level of technology used in the unit. Did you know: Night vision was first used in World War II and came into high use during the Vietnam War. These nightvision glasses use gallium-arsenide for the photocathode and a microchannel plate for gain. In Europe their sale is generally restricted to government departments and the military. Note: All Gen-2+ tubes are Russian-made, as the US technology switched from Gen-2 to Gen-3, bypassing the Gen-2+. Today due to the Russian legislature, the maximum sensitivity allowed for Export outside of Russia is 350 microamperes per lumen. A Gen 2+ tube is an improvement on the Gen 2 tube and has a light amplification of 22,000-25,000 times and sensitivity of 300-600 microamperes per lumen Resolution in the center is 39-50 line-pairs per millimeter. Lifetime is 5,000 hours. Generation 2+ devices are equipped with automatic gain control, which regulates the brightness of the image depending on the outside light condition. The units also have a flash protection and virtually distortion free image even at the edges. Until recently, such units were used by Military, but now they become more widely available. NOTE: Export outside of the US of any Generation-II and II+ model is controlled by the US Department of Commerce and must be approved by submitting an End-User Certificate. These devices differ from generation 1 and 1+ by using a special electron amplifier – the Micro Channel Plate (MCP). Two types of the intensifier tubes with MCP are available: the 25mm and 18mm. In general the larger the diameter, the more efficient the tube is, however it would also require a larger night vision unit when assembled. Generation 2 night vision equipment amplifies light about 20,000 to 30,000 times which makes them very good in low light conditions, so to give you an idea of what is possible, you can see a man at 90m on a dark overcast night, 300 meters in starlight and 600 meters with a full moon. The very little distortion, makes them well suited for use with video or still cameras. Gen 2's are excellent for the prolonged observation of wildlife at a distance as well as for close observation of small animals. They also have an increased sensitivity of 300-320 microamperes per lumen and increased lifetime of the tube (4,000-5,000 hours, compared to 2,000-2,500 hours of Generation-I and I+). Because of their cost night vision with Generation 2 are mostly used by law enforcement or for professional applications. Gen 1+ tubes offer a further improvement of the Generation-I tube with a fiber optic plate installed at the front or the back of the tube. This allows for a dramatic improvement of the image resolution and it prevents distortion especially at the edges. They provide a light amplification of 900-1,000 times and the sensitivity increases to nearly 300 microamperes per lumen. Resolution in the center is 50 line-pairs per millimeter. It is important to point out that some manufacturers use the designation I+ to incorrectly describe their regular Generation-I devices. A true Generation-I+ device costs as much as the low-grade Generation-II product. First introduced during the Vietnam war, Generation 1's are the least expensive night glasses and these days it is possible to faind fairly cheap night vision goggles, binoculars and monoculars with this technology. Every Generation-I device employs a vacuum tube with the photo cathode sensitivity of 120-280 microamperes per lumen. The light amplification of these tubes is 120-900 times the ambient light. Resolution in the center of the image is 20-38 line-pairs per millimeter. They generally have a maximum range of around 80m and often have a basic infrared illuminator built in. Generation 1 night vision devices usually have a higher power requirement and can emit a high-pitch, low-level noise. These products are not suitable for photography because they whist they are clear in the center of the view, they often have a drop off in quality around the edges of the image. They have many practical applications and are useful for wildlife watching at fairly close range. Rather confusingly, even within Generation-I, tubes there can be a big difference in performance. During the manufacturing process all tubes are evaluated and graded according to their quality and performance and are sold at significantly different prices depending on their light amplification and image clarity. This of course is reflected in the final price of the Night Vision device. The better manufactureres like Luna Optics only use the top grades of the intensifier tubes, which means that whist their devices tend to be a little pricier than some, you can be sure you are buying a quality product. Generation 4 night vision technology is not officially accepted by the military although the term is used frequently among manufacturers of night vision products. It is also referred to as Filmless & Gated image intensifiers. Filmless is the removal of the ion barrier film that was added to the Generation 3 image-intensifiers resulting in less "snow" on the image. Gated is referring to a “gated” power supply which makes it possible to operate night vision devices during daylight as well. It also improves the image resolution and minimizes halo from bright light sources. Overall Gen 4 is said to have an even sharper view than Gen 3 night vision and an even greater ability to see in very dark conditions, but once again it also means an increase in price with Gen 4 monoculars costing about five to six thousand dollars (US). 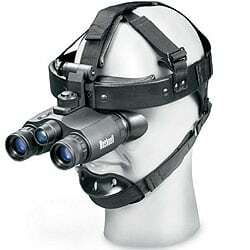 A specific type of night vision device that has dual eyepieces is the night vision goggle (NVG). Goggles do not have any magnification and this allows you to use them while in motion mounted on your head, perfect for night gaming, orienteering, driving, safeguarding and search and rescue applications. When looking to purchase a NV Goggles you need to check if they use one intensifier tube with the same image sent to both eyes, or a separate image intensifier tube for each eye. They often come with straps or Headgear to fit onto your head for use without hands. 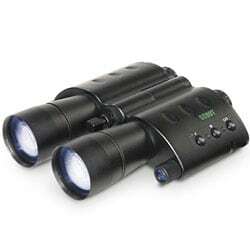 Similar to the night goggles are ones that has magnification lenses to magnify the image these are then referred to as night vision binoculars. Bushnell make a 1X20 Night Vision Gen 1 Goggle with Headgear (261020) that is detachable and so can also be used as a pair of binoculars. They also comes with a built in infrared illuminator and has a viewing range of half a foot up to 100 feet. They are lightweight, compact and great for close range viewing where where you need both hands free. One of the biggest brands in night vision, Yukon (sometimes miss spelt as Youkon) have the popular Yukon Tracker NVG 1x24 Night Vision Goggle which is head mountable, has a wide field of view and utilise a built-in illuminator for added image clarity in total darkness. The range of Yukon Tracker Binoculars are some of the most popular on the market and include the NVB Tracker DL 2x24 with 2x magnification and the impressive NVB Tracker RX 3.5x40 with 3.5x magnification. 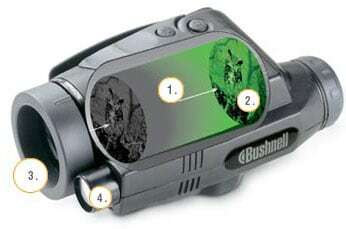 Bushnell have two NVB's in their range, the Gen-1 Bushnell 3.1x50 that comes with a tripod mount making them ideal for prolonged viewing at longer ranges and the compact, Gen-1 Bushnell 2.5x42 Night Vision Binocular with built-In IR (Infrared illuminator) that have a maximum range of 600 yards and a magnification of 2.5X, so objects 200 yards away will appear about 80 yards away. 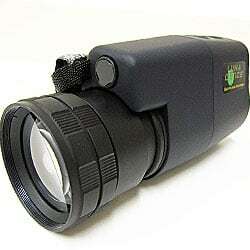 Monocular night vision devices have only one eyepiece and are sometimes also called Night Vision Scopes, if these are designed to be mounted to firearms and used as night sights, they are known as Night Vision Rifle Scopes. With a wide range that includes both Gen 1 and Gen 2 night vision monoculars, Luna Optics have most bases covered from budget devices to advanced professional grade night surveillance devices. For more take a look at my guide to Luna Optics Night Vision Monoculars. The Bushnell Night Watch Monoculars are some of the most popular on the market and includes the excellent Bushnell Digital Stealth View 5x42 Night Vision Monocular with Supercharged infrared spotlight. Yukon have a huge range of NV Monoculars, from the Night Vision Multi Task - NVMT 1 (2x24) monoculars that have a wide field of view perfect for general observation to the Extra High Magnification of the NV 5x60 Night Vision Monocular which has one of the most powerful magnifications (5x) of Gen 1 night vision devices. You can find a huge variety of rifle scopes designed for night use, for example in the Yukon range of night vision scopes, they have 5 different Gen 1 scopes with a maximum magnification 3x and 4 different Gen 2 night vision riflescopes with the Phantom 4x60 and the Sentinel 4x60 both having impressive magnifications of 4x. If you are looking for larger magnification night vision rifle scopes, ATN Mars Night Vision Weapon scopes, the world’s largest line of professional night vision sights has a new flagship scope, the ATN MARS 6x magnification, but be warned this Gen 3 night vision scope does not come cheap! Price of Night Vision Binoculars and other Devices? Night vision devices can be very expensive and generally the higher the Generation the more expensive the device with cheap night vision devices being a first generation device and typically a Gen 1 Goggle that will amplify the light several thousand times. This generation makes it affordable to get a pair of cheap night vision goggles which are aimed at the every day consumer and are ideal for camping and hunting. What are the infrared illuminators (IR Illuminator) for? All night vision equipment needs some light to work. Now days you will find many devices, even some cheap night vision goggles that come equipped with built in infra-red illuminators. These send out a beam of infra-red light that is not visible to the human eye, but is picked up by the night vision device giving it the ability to see even in what seems like complete darkness to human eyes. View >> All Night Vision Binoculars reviewed by Best Binoculars & Reviews. 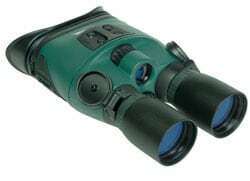 View >> All Nightvision Binoculars, Monoculars Goggles and Scopes in the Best Binoculars aStore. 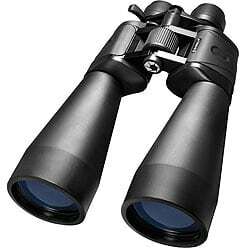 Below are some binoculars that I recommend as great Night Vision Binoculars.